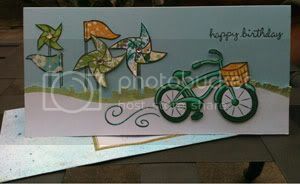 Do you remember my mentioning a couple weeks ago two birthday cards I made for friends back in July using Lawn Fawn stamps? No? I understand. I barely remember what happened 5 minutes ago. I bought Admit One and Cruising Through Life stamp sets specifically for these cards. I sketched the cards before I bought the stamp sets in fact. Now, don't mind the awful pictures that follow. 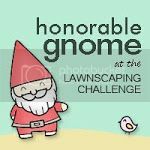 I have been experimenting with places to take pictures and have yet to find a good one. The cards are actually quite a bit cuter than they appear and it's all due to Lawn Fawn. I pulled out my Copic markers for both of these cards. 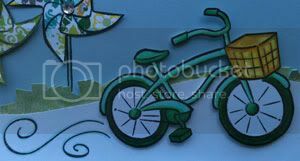 At the time I only had a handful of Copic markers (especially greens) to pull off the coloring of the bicycle on Card No. 1. In fact the majority of the bike is actually a pale blue-green (BG10 Cool Shadow) in order to obtain a minty green with the few colors I had (I believe it was G17 Forest Green & G28 Ocean Green). The grass is a shimmery green patterned paper I cut with Martha Stewart Crafts trim scissors that I then cut at different lengths. 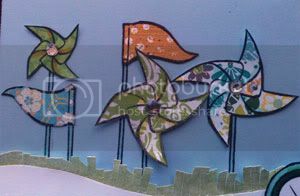 Paper piecing the flags and pinwheels is an excellent way to use up scraps of paper without losing its impact. 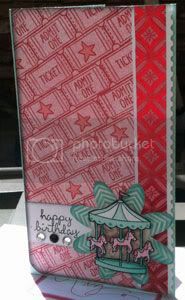 One of my favorite things to do ever is make background paper and the ticket from Admit One is a blast to use as not only can you stamp the tickets in lines easily, but in the stamp set are words and a star you can add to the ticket. 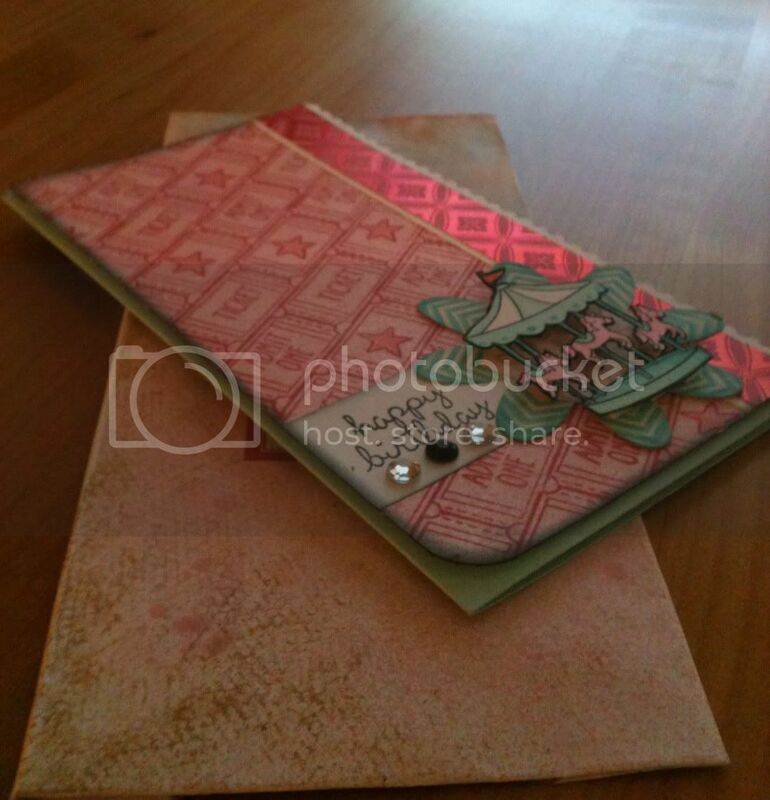 For Card No. 2, on the ticket paper I also sprayed it with some shimmery spray as my friend loves sparkle. I also like to alter items if necessary to fit a given project. The aqua flower was actually a pretty powder blue from sassafras which I colored in with a Copic marker to match the aqua found in this card. And the middle of the flower was a bit too busy so I placed a circle of vellum over it so that some of the pattern is visible without taking away from the carousel in front of it. 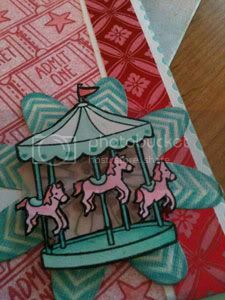 As to cutting out that carousel, just take your time, but it is well worth it and you can always use a dark marker to cover up the raw edges from cutting. You really rocked these cards and lm not just saying that cause one of them is mine LOL...these are awesome! you attention to detail:: AMAZING. thank you so much for taking the time to visit me a while back. 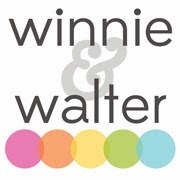 always great to meet new friends in this wonderful blogging world.